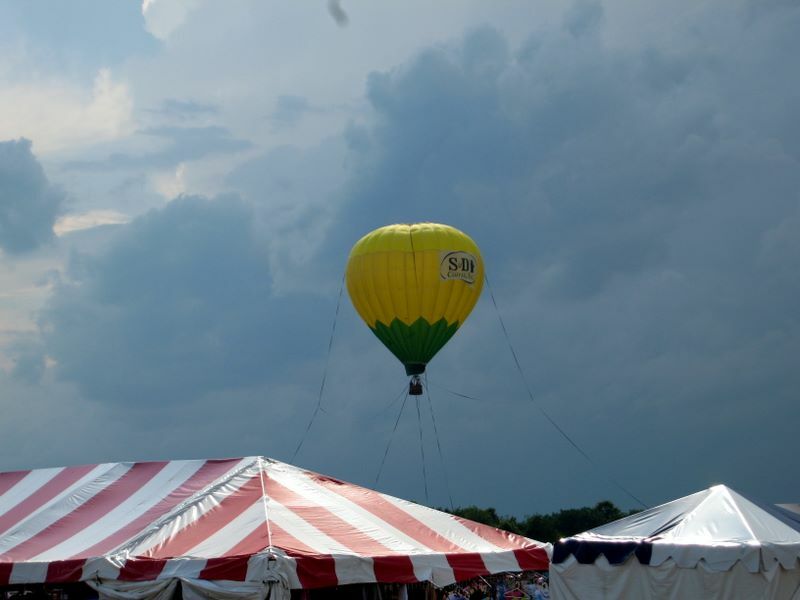 The 27th Annual Quick Chek New Jersey Festival of Ballooning | Tales From The Ipe! Don’t you think a balloon festival should have balloons? Let me explain. Last Sunday, we met up with my sister and BIL at the 2009 Quickchek Balloon Festival. Officially, it was the 27th Annual Quick Chek New Jersey Festival of Ballooning, but I shall refer to it as “the balloon festival.” Maybe it was the 11-year-old in me, but I was imagining a big festival with 50 or more hot air balloons, festival attendees gawking, going up on rides, chocolate lamp posts, and rose-colored glasses and fried dough for everyone. Not quite what I was expecting. It was $25 per ticket for adults, and $10 for kids 4 and over. That only included admission to the festival grounds at the Thor Solberg airport in Readington, NJ. All the festival food and activities were at normal price-gouging levels. There were so many people, we ended up parking on a grassy field that was extremely muddy. Try pushing two strollers through the squishy mud. It was hot. It was so hot, the sun was beating down like it was the desert. The sweat was dripping so much into our eyes, it burned. There was no place to sit that wasn’t crowded. Did I mention the price-gouging? There were no balloons! That’s right, no balloons. They are only inflated at 6:30am and again at 6:30pm. I had hoped to see some balloons, so we did what we could to pass the time. We waited on lines for freebies from PNC Bank and QuickChek. We took Josh on some kiddie rides. Around 5pm, a heavy thunderstorm came into the area. We’re talking rain, lots of lightning, and high winds. I got separated from everyone, and then the wind and rain really hit. Festival organizers recommended to folks to head to the safety of their cars around the same time a tent blew down. Somehow, we made it all back to our car, and the storm finally passed. However, we were pretty beat, and weren’t waiting around any more hours for the balloons, so we hightailed it out of there. We met up at a nearby diner for dinner and to decompress. Would we do it again next year? I have no clue. This entry was posted in Family, Personal and tagged balloon festival, julie, robbie. Bookmark the permalink.